I have ‘A Man Called Ove’ on my iPad and just haven’t got round to reading it, but I’d heard such positive things about it that I decided to give this one a whirl – and I’m so glad I did. ‘Every child needs a superhero’ we’re told near the start of this novel. The value of having someone to look up to and admire, who will fight your corner and simply love you because of who you are cannot be underestimated. I never saw enough of my grandparents to ever feel this strongly about them, but I can see the bond between my own children and their grandparents, and I was really touched by the relationship between Elsa and her grandmother. Their love for each other – even when they get angry at one another (which happens often) – pervades the novel. When we first meet the pair I admit to being perplexed. Seven year old Elsa and her grandmother are in the police station having been caught breaking into a zoo. Grandmother has been throwing excrement at the police sent to get them, and it’s quickly established that this is not the first time the pair have been such a situation. So different from most people’s experiences, I really didn’t know what to make of it. However, as we watch the pair bicker about how to deal with what happens next, and we’re given the real reason why they ended up at the zoo in the middle of the night, I was entranced. Early on in the novel, Elsa overhears her grandmother talking. She has cancer, is going to die soon, and is desperate to ensure Elsa is looked after. Being left out of the loop by the adults around her results in Elsa’s imagination going into overdrive. At this point in the story I was hooked by the role fairy tales and imagination play in what is happening. Backman maintains the persona of Elsa throughout, and I am convinced that everyone who reads this will fall a little bit in love with her. 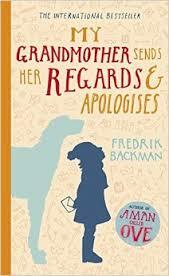 As Elsa carries out her grandmother’s last wishes she starts to lean more about the adults who live around her, and the ways in which their stories interconnect was skilfully revealed.